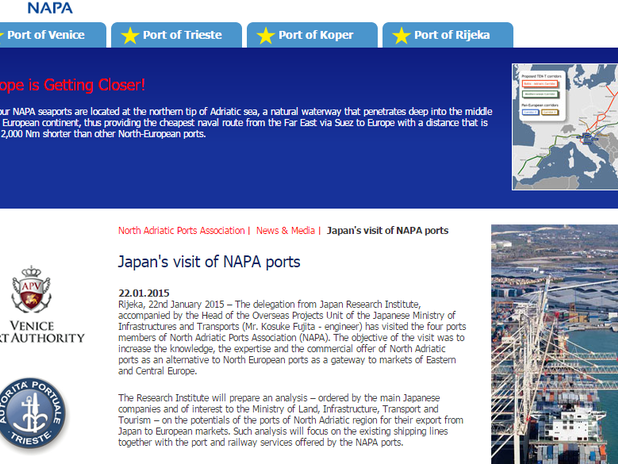 Rijeka, 22nd January 2015 – Today the “study tour” of NAPA ports by a Japan Research Institute delegation, accompanied by the Head of the Overseas Projects Unit of the Japanese Ministry of Infrastructures and Transports (Mr. Kosuke Fujita - engineer) reached its final destination in Rijeka (Croatia). The objective of the Italian visit mission to the four NAPA ports was to increase the knowledge, the expertise and the commercial offer of the North Adriatic Hub as an alternative to the North European ports as a gateway to the markets of Eastern and Central Europe and Russia. The Research Centre will prepare an analysis – ordered by the main Japanese companies and of interest to the Ministry of Transports – on the potentials of the Adriatic region ports for export from Japan to the East European markets in particular. Such analysis will focus on the existing shipping lines together with the port and railway services offered by the ports that the Land of the Rising Sun sees as 4 quays of the same port. The delegation was also especially interested in learning the position of the EU, the planned development and investment plans for the growth of the hub as well as for the new CMA-CGM/UASC/China Shipping Container Lines route which will directly connect the Northern Adriatic and the Far East from February 2015.